Growing public protest, along with two landmark lawsuits, may put an end to this dragnet policy that overwhelmingly targets young black and Latino men. In his 2011 book The Rights of the People, David Shipler describes North East Washington, DC, just a few blocks from the Supreme Court, as “another country.” It deserves that name, in his view, because young black men in its poor neighborhoods are routinely subjected to policing that the rest of the city—and nation—would reject as utterly foreign. As he rides along with officers from the DC police gun unit, Shipler watches them subject young black men to aggressive stop-and-frisk searches with little or no suspicion—and marvels that so many young men have come to expect this demeaning treatment as a normal part of their daily lives. If North East DC is another country, the poor neighborhoods of New York City are another world, where stop-and-frisk policing has risen to unprecedented levels. From 1990 to 1995 the NYPD subjected about 40,000 people a year to these searches. In 2011 that number skyrocketed to more than 684,000. According to a New York Civil Liberties Union report, blacks and Latinos bear the brunt; together they make up 52 percent of the city’s population but 87 percent of those stopped and frisked. A detailed analysis of six years of NYPD data by Columbia law professor Jeff Fagan in 2010 found that race predicts stop-and-frisk patterns even after controlling for variables like crime rates, social conditions and the allocation of police resources, and that blacks and Latinos are more likely to be stopped even in predominantly white neighborhoods. Part of the problem is that stop-and-frisks largely evade judicial oversight. When the police arrest someone, they must either have a warrant issued in advance by a court based on probable cause that the person has committed a crime, or, where arrests are permissible without warrants, the police must demonstrate probable cause to a judge within forty-eight hours. Thus, officers know they must justify all arrests with hard facts to a judge. That knowledge is an important bulwark of liberty. In theory stop-and-frisks, like arrests, are regulated by the Constitution. The Supreme Court ruled in 1968 that police must have objective evidence providing “reasonable suspicion” of criminal activity before they can forcibly stop a citizen, and they must have an independent basis for fearing the person is armed before they frisk him. That standard is lower than probable cause but more than a hunch: it requires objective, individualized suspicion—not racial stereotyping. In practice, however, the vast majority of stop-and-frisks are never subjected to judicial review because most stops don’t lead to arrests. Thus, these encounters are not “policed” by courts the way arrests are. And, not surprisingly, when police officers—like anyone else—know they are not being watched, they are likely to cut corners. Fagan found that in nearly a third of all stops, police records revealed either that the stops were unconstitutional or that officers did not provide sufficient information to establish that they were legal. In New York, it appears, the tactic has been employed not, as the Supreme Court originally conceived it, to disrupt ongoing criminal activity but as a generalized deterrence strategy. NYPD officers stop and frisk hundreds of thousands of citizens each year not because they believe all of them are engaged in criminal activity but because they believe the prospect of such stops will dissuade people from carrying weapons. (Stop-and-frisks in New York discover guns in only about one of every 666 stops—or 0.15 percent; police say that’s because deterrence is working.) In short, it’s an informal means of gun control. But as with many such tactics, black and Latino men bear most of the burden. The NYPD points to the city’s dramatically low crime rate and claims that by reducing violent crime, its tactics have saved thousands of lives. The city has indeed seen a remarkable drop in crime for two decades now, better than in any other major American city, so it must be doing something right. But as criminologist Franklin Zimring writes in his new book The City That Became Safe, there is no evidence that New York’s improvement is attributable to the stop-and-frisk policy, as opposed to a number of other possible factors—increased staffing, better supervision, a targeted focus on “hot spots” and the easing of the crack epidemic. No study has confirmed the NYPD’s claim, but that hasn’t stopped the department from making it repeatedly. Yet the city’s crime rate drop began years before the stop-and-frisk policy was implemented, so something else must be going on. It has been almost impossible to challenge racial disparity in criminal law enforcement in the courts since the Supreme Court ruled in 1987 that even vast disparities are insufficient to establish a denial of equal protection without proof of overt racial bias. But two landmark lawsuits challenging stop-and-frisk—one brought by the Center for Constitutional Rights in New York, and a second brought by civil rights lawyer David Rudovsky and the ACLU in Philadelphia—have had surprising success. They have focused not only on the glaring racial disparities but also the large number of stops that simply lack a constitutionally sufficient justification. Their goal is to bring this practice out of its “law-free zone” by demanding monitoring and oversight. In May US District Judge Shira Scheindlin granted the New York plaintiffs’ motion to proceed as a class action, repeatedly citing Fagan’s report and finding a common practice of potentially unconstitutional actions directed at black and Latino citizens. In the wake of that decision, Governor Andrew Cuomo has recommended decriminalizing public possession of small amounts of marijuana, because that charge is one of the most common grounds for arrest in stop-and-frisk searches. 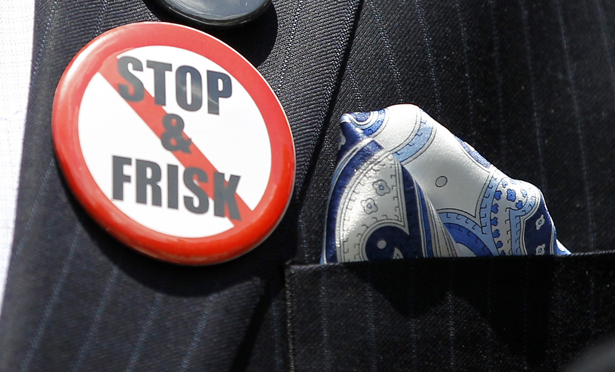 And the issue has mobilized the NAACP and others to call for a silent march against stop-and-frisk on Father’s Day in New York. Last year Philadelphia agreed to settle the ACLU’s class action. Among other things, it agreed to detailed monitoring of its stops by plaintiffs’ lawyers, with judicial supervision. And it agreed that stops may not be based solely on such vague rationales as “furtive movement,” “loitering,” “acting suspiciously” or being in a “high-crime” area. These lawsuits seek to put in place the oversight that’s been missing and is critical to making constitutional theory a reality. The legal principles are not in dispute: stopping someone because of racial generalizations denies equal protection, and stopping someone without grounds for suspicion of criminal activity violates the Fourth Amendment. The problem has been how to make these principles work where police routinely act without monitoring. The New York and Philadelphia lawsuits call on the police and the courts to make good on their promise of equal protection under the law for all. Read this editorial in Spanish.